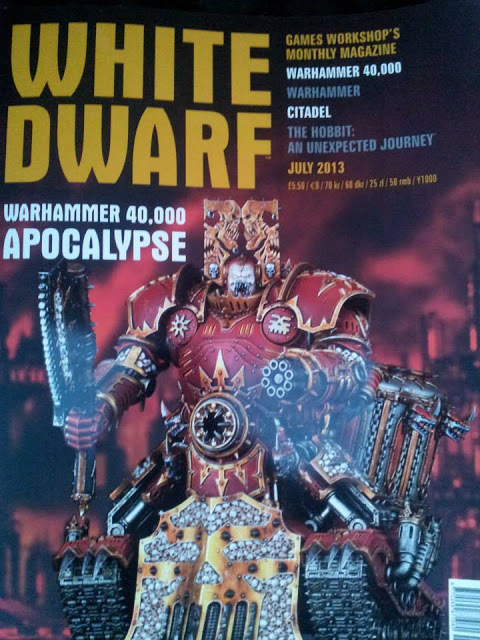 Okay, I've said it before "Has GW finally jumped the shark?" The answer in the past has been "Yes" but then they release something that takes it entirely to a new level. Some were expecting Lizardmen but anong the wiser heads it was always going to be a 40k release for July. Summer in the Northern Hemisphere and Timmy is off school wondering what to spend Gran's birthday money on. Think no further Timmy because have we got the answer for you. It's a giant Khorne Berzerker (cos everything is GIANTZ now) mounted on a bulldozer with a cattle grill off Thomas the Tank Engine. And we can use bits of the Skullcannon too. So what do you think this thing will be called? Based on a study of GW nomenclature I suspect we'll see the Marketing Department christen this the SKULLGRINDER!!!!!! I am hoping that there is a Chaos God and there is no crossover potential for Fantasy. Pleasssssseeee. Somewhere off the New England coast, there is a massively large Great White Shark wondering, "What the hell was that?" That is a "Lord of Battle". in Epic 40K it was a massive Daemon engine, basically a mechanical greater deamon. who knows what it will be called now of course. I have a White Dwarf promotional magazine from the early 90's with the artwork of one of these on the cover. Looks like a re-sculpt of the old Epic model. I always thought they looked pretty choice. My issue with it, not sure about others, is that it's too big for a 28mm scale game. 6mm is fine, that's what Titans and super-heavy armour is for. But if that thing is bigger than a Land Raider (which seems likely) I think it's too big for a table. It'll probably also cost the same as the national debt of a small African country. Finally, what the hell does it need a chain-axe for? A turret with an 8-inch gun would be more useful. Looks like an Apocalypse expansion though, which I think means massive battles, massive tables, massive machines (like titans). Not the sort of thing that one would field in a 'normal' game, but you never know. it needs an chain axe for chopping down redwood trees. Got to have a day job. Maybe it has some sort of strange daemon-dyslexia thing, and thinks it's 'Wood for the Wood God'. At least it has the 'Skulls for the Skull Throne' thing right. Nah man that's the Lord of Battle....definitely. Will be interesting to see if they give it a different name and inch a little closer to erasing past games completely. Looks like the transformers have turned to the worship of Khorne. Sorry but I think the comments are a little unfounded here, it's an existing model that has been around for over a decade, it's just been only in the epic scale. 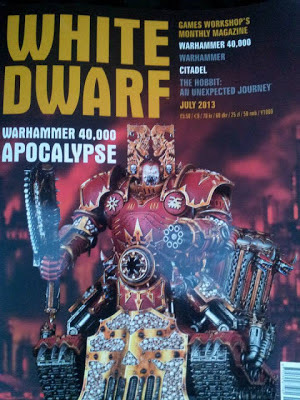 The actual question you're then left asking is "has GW jumped the shark with apocalypse?". I don't think they have. Apocalypse definitely has it's target market. It just so happens that we're not that target market, and when ever anything isn't exactly what WE wanted, we like to be overly vocal and dramatic about it, because it's all about us. I've played one game of apocalypse, I don't intend to play another and I didn't really enjoy it. That doesn't mean there's anything wrong with it, just that it's not for me, and I'm perfectly happy that it IS what other people want. The great joy of this hobby is that there is plenty of room for people to consume it in what ever way they want. Bring back the real Charlie!!! The Apocalypse is really happening!!! !